Oceanside’s foray into France is a warm, introductory tour, with seven or eight dishes that you’ve either tasted or heard about. Given that French cuisine generally has been welcomed on Long Island slightly better than the Russian winter greeted Napoleon’s Grand Armée, the new addition understandably stays risk-averse. But you’ll also banish any reverie of crisp-crust baguettes and long-churned, ultrarich butter as well as reflections from distressed mirrors and shelves with bottles of Ricard. No wide-plank, weathered floors, either. Still, the woodwork is polished and dark and the chairs have the right rattan look. Besides, the TVs are tuned to sports, sometimes soccer. Suitably disarmed, march on and begin with chef Wen Chen’s enriched version of frisee aux lardons, the bright salad with lettuce similar to endive and often called chicory, entangling nuggets of bacon, topped with a poached egg, and here, to liven things up, a scattering of Maytag blue cheese. It’s much better than the tired roasted beet salad, where the blandness is cut only by toast slathered with goat cheese. Onion soup gratinee arrives thin and pale rather than deeply hued and bracing. Even the cheese is forgettable. Braised oysters with leeks and creme fraiche turn chewy and are overwhelmed by their modest sauce. The larger disappointment: escargots, out of the shell and rubbery, set in a soupy plate of white beans, all with an unpleasantly acidic aftertaste. You’ll be dreaming about dimpled plates and garlic-parsley butter. The openers improve dramatically with a meaty crabcake that’s boosted by capers and saffron mayonnaise; and the opulent, seared foie gras, flanked by half of a sweetly poached peach and brioche toasts. 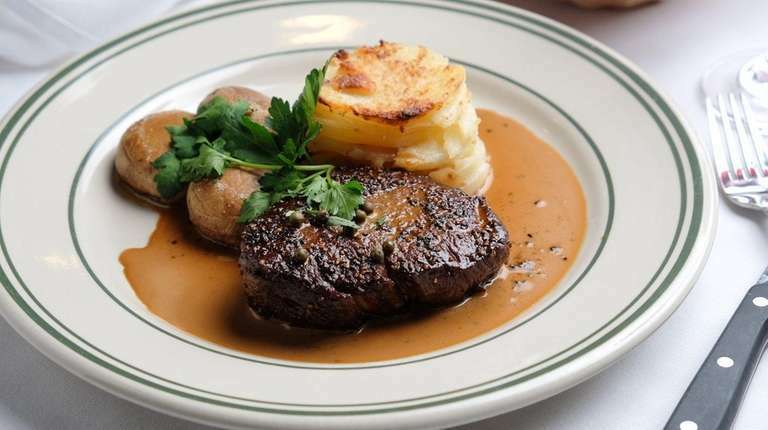 It’s a very satisfying prelude to filet mignon au poivre, a velvety affair with just enough pepperiness and cream, even though the rendition of dauphinoise, or scalloped, potatoes is pretty restrained. The strip steak frites, fibrous and juicy, benefits from the company of crisp fries. The kitchen continues its travelogue with the rosy, juicy roasted duck breast and confit of duck leg. The roasted chicken also stands out, flanked by fingerling potatoes and spinach finished with garlic. Croque monsieur, the classic, browned ham-and-cheese sandwich, heads the more casual alternatives, followed by a grilled chicken sandwich with bacon and Sriracha-sparked mayonnaise. You can order a bacon cheeseburger, too, and add avocado to it. A special of whole, pan-roasted orata, with tangy red pepper sauce, couscous, dates and slivered almonds, tastefully brings in hints of the Mediterranean and North Africa. Grilled tuna with red-pepper vinaigrette and grilled Scottish salmon with lemon-truffle vinaigrette provide the safety-first competition. Wayne continues to expand the map, raising a different tricolor, with the inevitable concession to pasta. But at least it’s well-done rigatoni with spicy sausage in a tomato-cream sauce. The spinach-and-cheese ravioli, served with wild mushrooms, are a serviceable Italian detour, too. The Italianate theme also takes in scallop-and-shrimp risotto, with asparagus. The apropos dessert is a generous, warm apple crumble, topped with vanilla ice cream. You can try a blueberry crumble the same way. Or give in to crème brûlée. Skip the mushy cranberry bread pudding.